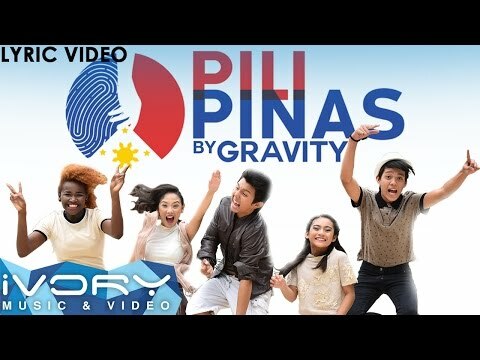 The pop music group Gravity, composed of Grace, Eufritz, Zack, Julienne and Rommel got privilege to sing the official theme song of the 2016 Philippine Elections - "Pili Pinas", commissioned by COMELEC and produced by Ivory Music & Video Philippines and we are so proud. Pili Pinas is a contraction of "pili" or choose and Pinas - Philippines and what better way to prepare, remind and instill the importance of clean elections and duty of voting to young voters than a catchy pop song from the band. If you listen closely to the lyrics, there are 5 important things to remember. This is your first major step in making a great positive change for the country. Ask yourselves, how do you see the Philippines 6 years from now? Start with your barangay, do you want your place to be cleaner and greener? More emphasis on school and youth development? Start by supporting candidates that offer platforms or programs that reflect your dreams. your decisions based on your conscience. If course, your duty doesn't end after you've dropped your vote. Monitor activities in your barangay and be on the lookout for suspicious activities. believe is not beneficial to the people. Criticize and be involved at the same time. And finally, never ever forget the vision you first made for the country. As a voter, you also have the responsibility to give and give back. The government can only do so much. Do your part, start with yourself. Learn to say no to shortcuts, shortcuts are the first step to corruption. Start with your family too, help them as they are the closest persons you have in the community, but never indulge in nepotism or favoring things to people because they are a relative. Achieve things through hardwork and patience. Acknowledge the people who helped you but never attempt to repay them out of debt of gratitude. Be careful of people who will only help you and ask something in return later on. Only work with people that ask one thing in return for the good things they give you, and that is to pay it forward. Pay it forward means, give back to your community, help those who could not. And most importantly, lead yourself. No one can captain your ship but you. Don't stop learning, never stop asking questions. Appreciate the present, but never settle down for average. Constantly improve yourself. Never rely your future on someone else's hands. This is how we Filipinos dream, we do our duty, we guard our nation, we stand together and lead ourselves - this is how we "Pili" in "Pinas". And big grats to Gravity for such an awesome theme song.